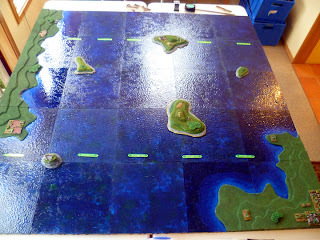 We played a 4 player game this weekend. 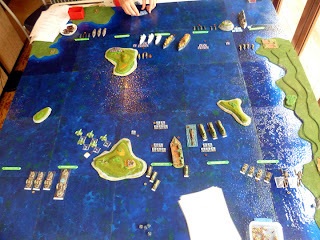 Because 2 of our players arrived a little late this was a 2 stage game, with 700 points of Republic of France fighting the Empire of the Burning Sun, the French were then reinforced by 600 points of Antarctica on turn 2, while the Japanese were reinforced by 600 points of FSA. 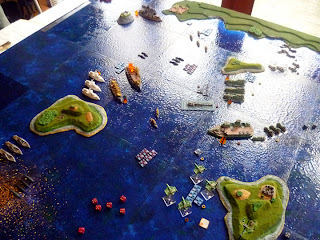 The Japanese Admiral is eager to close with the French forces, so eager in fact, he orders the mighty fleet carrier forward to lure the French forces closer, while the huge dark shadow of the might Ika shadows the carrier beneath the waves, waiting for its prey to draw closer. 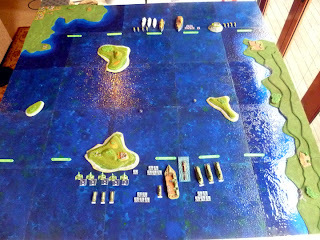 The Tetsubo small flyers also thrust forward, but not far, as they are all too aware of the rapidly approaching formations of French fighters, and the formidable flak batteries on the French support cruisers. 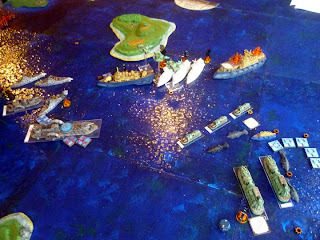 The French advance and there is a brief exchange of fire which claims a single Lyon frigate. Now the reinforcements arrive. An American battleship and cruiser squadron reinforce one flank of the Blazing Sun, while a pair of John Henry flying robots and a squadron of frigates take the other side. 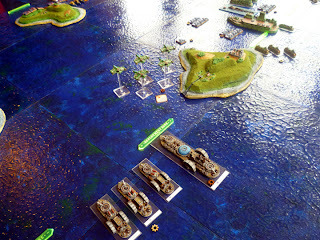 The French are reinforced by a Covenant cruiser squadron and an aircraft carrier on the other flank. 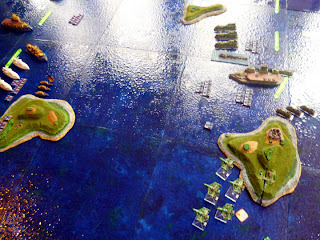 Drones launch and buzz angrily into the sky, while several squadrons of frigate spread out across the French lines, moving rapidly toward the Blazing Sun. 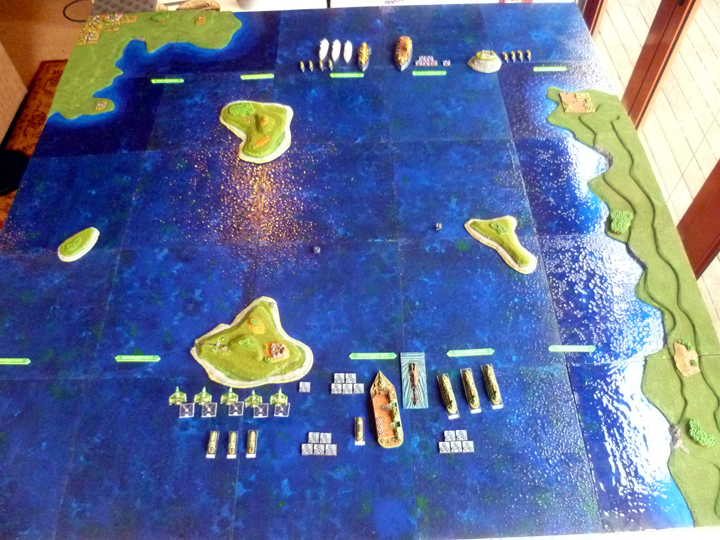 Torpedo and dive bombers descend from the sky, striking at carriers. 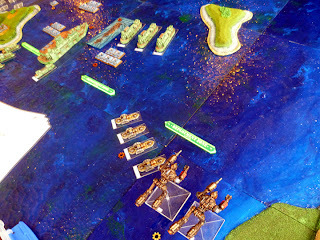 Dogfights erupt as fighters streak in to intercept them, and the air is soon filled with streaking shapes and tracer fire. 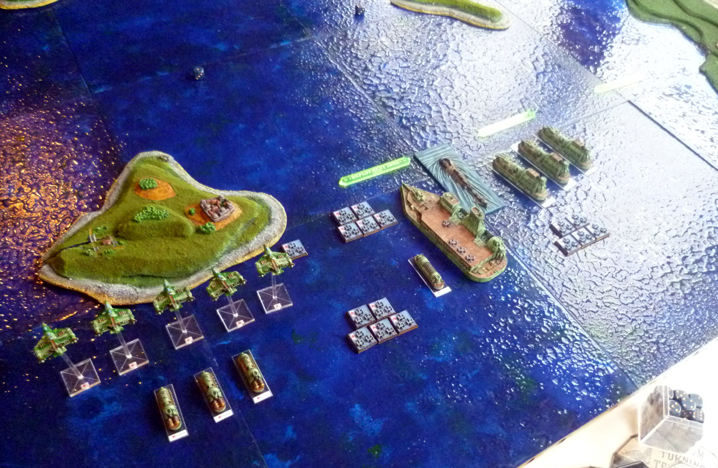 Before long all 3 carriers are ablaze, consumed by raging fires. French fighters desperately engage the Tetsubo aircraft, claiming one, while another is downed by Covenant cruiser fire, but the remaining squadron swoops down on the French battleship deploying their lethal gas. Although the attack is beaten back, and all of the sky Samurai are slain, their combined assault and lethal gas kills all of the French marines, leaving the Magenta a tempting target. 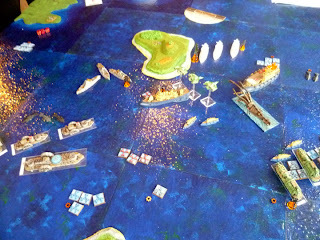 The French carrier engages its heat lance and rakes the blazing sun carrier causing massive damage, and killing many of the crew. 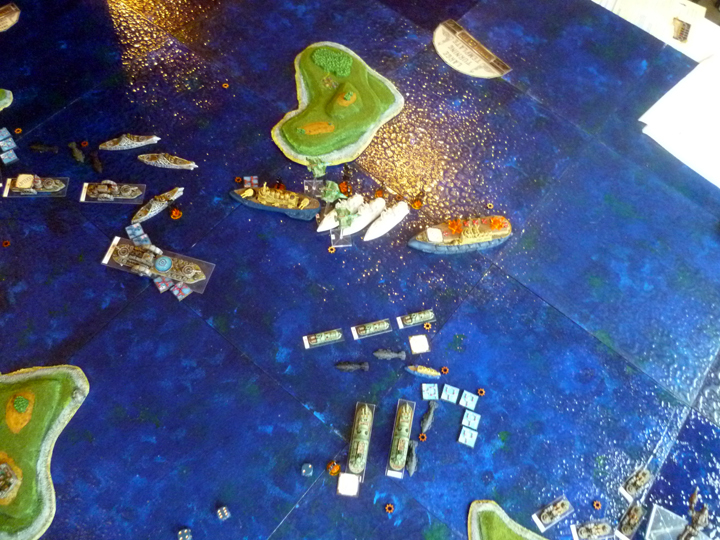 The Tanuki Gunships score several powerful hits on the Antarctic carrier, but French Torpedo bombers strike back, causing severe damage to one gunship while fire from the powerful French Carrier broadsides causes damage to another. Blazing Sun torpedo bombers strike back and the French carrier lists under successive torpedo hits. Then, rising from the deep, the mechanical Ika wraps its tentacles around the carrier. The marines aboard fight bravely but all are slain under the ferocious onslaught, leaving the carrier derelict. The victory is shortlived however, as the French Marines from the support cruisers leap aboard the Ika, destroying it's remaining mechanical tentacles and consigning it permanently to the deep! The Lyon frigates advance to close quarters, their gunnery is devastating and inflicts heavy damage on the Tanuki Gunships. 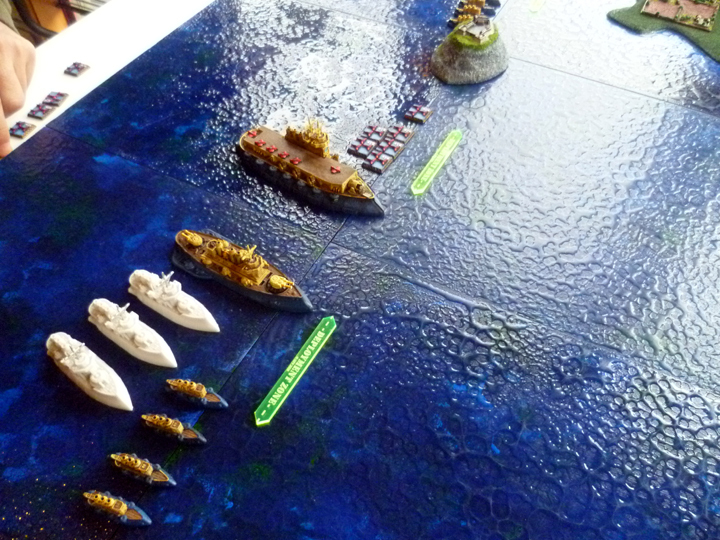 However, having revealed their potency, the brave frigates are sunk in quick sucession as the Gunships collide with them, while others are picked off by enemy fire. 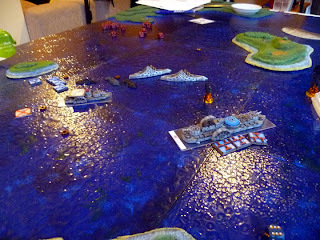 On the flank the John Henries fire rockets and guns into the Antarctic carrier, but the reliable shields of the Covenant prevent catastrophic damage. 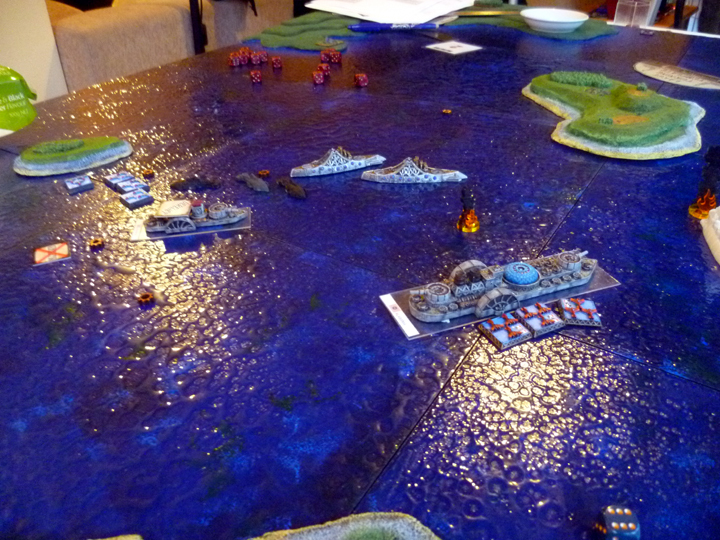 Meanwhile the Covenant frigates move into close range with the Japansese cruisers, raking them with fire. The Japanese frigates also exploit the proximity of the forces, and account for several of the Covenant frigates, and inflict more damage on the French support cruisers. 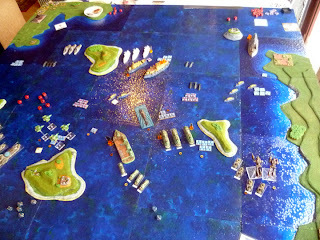 Their triumph is short lived however, as the return fire from the Capital ships claims them. 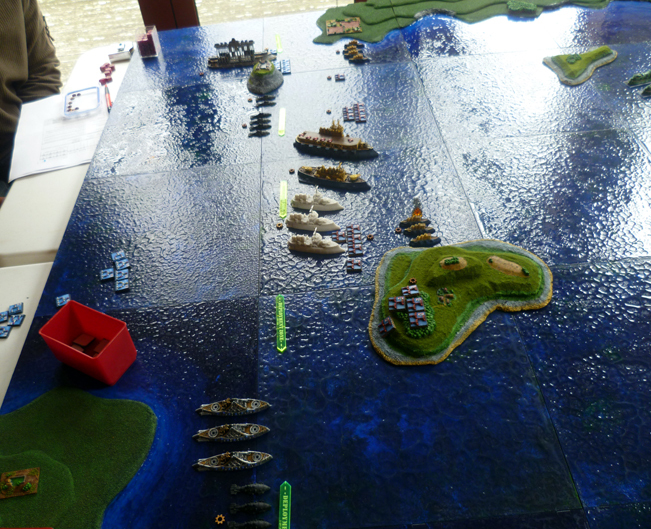 The American cruisers and battleship engage the antarctic cruisers, the fighting is fierce at such close range. 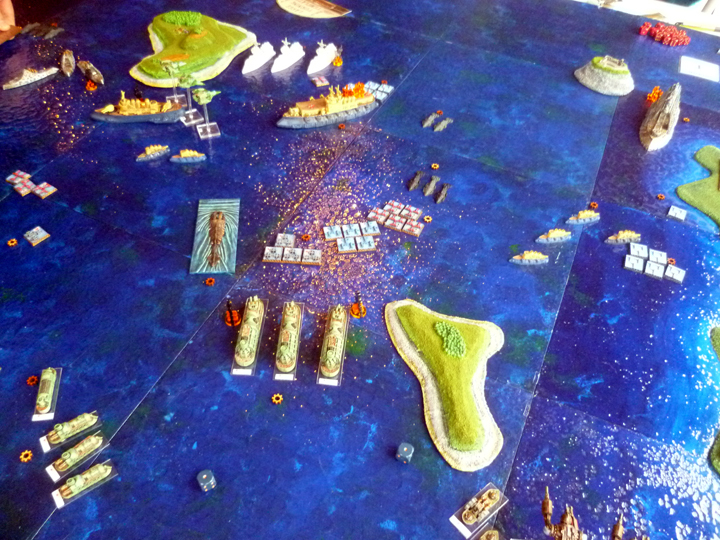 The swift action of a squadron of covenant frigates who mount a desperate boarding action against a Lexington helps to turn the tide. The Independence battleship, which has suffered no damage now turns its guns on the wounded Magenta battleship and fires volley after volley, until the mighty French ship slips beneath the waves. At the conclusion of the game the losses have been high. The Empire of the Blazing Sun has just one gunship remaining, while the Republique of France's force has been reduced to the 3 badly damaged support cruisers. The Covenant have two cruisers which have sustained light damage, a damaged carrier, and several frigates, while the only losses the Americans have suffered are the Lexington cruisers.